Robotics enabled by artificial intelligence and machine learning is proving to be a game changer that will bring unique operational efficiencies to the financial service industry, worldwide. In Sri Lanka, continuing with their trend of pioneering innovative digital banking solutions, Sampath Bank is poised to revolutionize the financial industry with a banking robot that works in the form of a humanoid teller. A never before in Sri Lanka phenomenon, the robot uses artificial intelligence to understand customers’ requests and performs transactions. It detects the presence of a customer and automatically initiates a conversation. Currently the humanoid teller can speak and understand English and can perform seven functions; cash withdrawals, account balances, exchange rates, interest rates, details of loans & credit cards and information on how to open an account. With customer service and convenience foremost amongst the priorities of Sampath Bank, the robot is a part of their active digitalization initiatives. The humanoid teller will be programmed to perform more functions upon studying the customer requirements further. The bank is also planning to include Sinhala and Tamil language capabilities in the coming months. Currently Robot Banking is available at the Sampath Bank, Head Quarters Branch at # 110, Sir James Peiris Mawatha, Colombo 02. Basking in the glory of this powerful new innovation, the bank takes time to look back on the many firsts that have placed them in the leadership position they are in today. Since its inception over 30 years ago, Sampath Bank has introduced Sri Lanka to many firsts based on the concepts of modern banking through a combination of innovative thinking and harnessing the powers of modern technology. 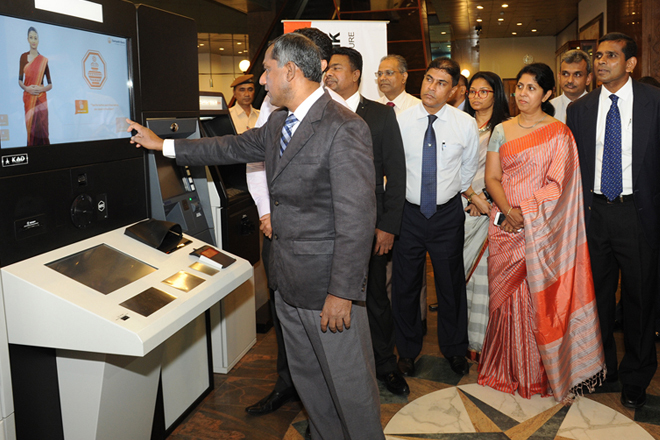 Today it has emerged as one of the most progressive and forward thinking banks in Sri Lanka. While focusing on keeping abreast with global banking trends, Sampath Bank pays close attention to the needs, requirements and evolving lifestyles of its customers and is constantly developing new avenues to take its products and services to them, through simplified processes and digital solutions. The bank’s other main product innovations include the launch of Sri Lanka’s first Foreign Currency Exchange ATM which allows the exchange of US Dollars and Euro notes to Sri Lankan rupees as well as the Sampath mobile app which allows customers to conduct transactions on their smartphones. Sampath Bank auspiciously began this year with the launch of 10 digital products designed to save the customer time and money. They are also proudly celebrating 30 years of sterling service and offering futuristic banking options to the Sri Lankan public this year. Revolutionizing the banking sector is foremost in their mind and this new foray into the robotic era sets the bank firmly ahead of the rest.